'No way' – Jose. Enrique dismisses Sunderland rumours! | NUFC Blog. ‘No way’ – Jose. Enrique dismisses Sunderland rumours! 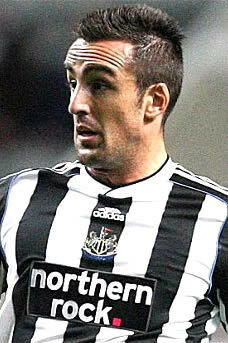 If it was possible, given his start to the season, Jose Enrique will have gone up in the popularity polls amongst Newcastle supporters, after he went on record to say he’s not interested in the alleged interest of Mackem boss and alleged Geordie, Steve Bruce. It’s taken a while for some people to grow to Jose, given his penchant for playing the ball out of defence and occasionally ‘over’ playing it. But this season he has generally done things in the right areas, and is clearly one of the best players in the Championship. The left back has shown defensive resilience together with an appetite for getting forward and his strength and pace allow him to do both to great effect. Interestingly enough, particularly for any of us who have supported Keegan and/or Shearer during this latest crazy period at Newcastle, Enrique then went on to say, Hughton is the manager he has enjoyed working with the most in his time at the club. Make of that what you will. “It is the first time he has had the opportunity to do the job properly and he has proved he is a good manager. Not sure whether there’s anything beyond that “at the moment” comment? Either way, this is great news for me provided both he and the club ensure he can keep his word, as I’ve not enjoyed watching a player in black and white quite as much for a long time. His performances have been a different gravy to some of the crap we’ve had to watch and he makes it look effortless. Jose, Jose, Jose, Jose…indeed. Smith Trotting out of Toon and does Jose know the way? Newcastle United: Class of 1993 or 2010 – Which team is better? Newcastle United’s promotion: The stats. Hope he stays true to his word the lads a quality player. well said jose! “I don’t care about Sunderland” cried Jose. “Nobody cares about Sunderland” came the cry from SJP! The NoTW was speculating that he may be part of a swap deal with Kieran Richardson coming this way! Jose’s a top man and we should keep him and take Richardson from the Mackems!! That should teach them not to start rumours. I fear if fat Mike does sell him as that will leave us without a recognised LB. We could do with bringing a back-up in rather than letting our 1st (and only) choice go. Isn’t Kadar also rated at left back? I’m sure he played there a lot last season albeit for the reserves and kids so we may have some back up. As for Richardson – good enough for the mackems to let him go? He’s got a devilish free kick but I’ve never seen anything else about his game. He’s a surly git anyway. No thanks! Jose came to the Toon with big expectations and a big fee, over five million i believe. It has taken him the usual season to adjust to the speed and physicality of English football and is playing well. He is a player with deceptive pace and has the ability to get forward in an attacking role, although not tall he is strong on the ball and reads the game well, a solid defender who nly needs to improve his end product when attacking. I am sure other clubs have scouted him and i believe he can only improve with time, in which case we would be foolish to let him go. So Steve eat your heartout he`s staying. 6ft 1/2 is quite tall for a full back actually. Reads the game well? That’s exactly what he doesn’t do well. Jose Enrique is a fantastic left back purely for his work rate and ability to never get done on pace or strength, as well as his ball control. His only flaw is his passing to feet and concentration in spells/decision making. If he can perfect those he will be the finished product, although being only 23. I love the fact people criticised Allardyce and his signings – Smith and Enrique particularly getting heavy stick. Given time, those 2 have turned out to be vital players. Given time, could Allardyce have turned all those “flops” into vital players? I think so. Let’s not forget, we could have a back four of Beye, Faye, Taylor and Enrique if we kept him. We’d have Lassana Diarra and Arshavin too. Newcastle all over me, living in the past :( haha sorry lads. Andy – that’s dead right. I know the football seemed dreadful at the time but it was way too early to sack the guy (I didn’t like him but so what!). Diarra and Arshavin would have transformed the team. It pains me that we swapped that for a ten game crap run under KK then the most dreadful of seasons. Maybe we wouldn’t have needed the maestro Wise either. So frustrating looking back on the whole event. How we hate Ashley – But Allardyce was a Shepherd appointment. How we love KK, but his appointment ultimately led to our relegation. I was relieved to be free of Allardyce’s brand of football but I wasn’t convinced it was the right thing to do. I was convinced, like many others, that it was a ‘popular’ decision. Why would we have gotten Diarra and Arshavin though? Arshavin publicly stated he wanted to join us. I thought it was well accepted that Diarra was having a medical up here before Allardyce got sacked. The Arshavin thing is definitely true though. Do people honestly think Ashley would have signed Diarra and Arshavin? They cost real money, which is probably why Allardyce was sacked when he was, to avoid any spending in the transfer window. And yes he made some half decent signings considering he didn’t have loads to spend, but we were heading for relegation under him the way things were going. Although Barton has been a disaster and Smith contributed very little in the Premiership even though he cost 5 or 6 million. Maybe my memory is going as I plummet into my thirties. I don’t recall Arshavin saying he wanted to sign. Just plenty of rumours. And not sure about the Diarra thing but like I say, could be the old fuzziness creeping in. Talking sense there Andy for once, yeah i remember Sam saying he would have tried to buy Diarra and talking about buying Arshavin, wouldnt have come to us though after his preformances at euro 2000 and something. Ah not another debate about the past! I’ll just say we were mid-table and Ashley backed Allardyce like no other manager since he’s been here, which is ironic considering he sacked him! On top of that, Allardyce is reknowned for doing well on a budget, and sacking him would mean compensation for him, so Ashley’s logic there compared with his money saving policy now seems very weird indeed. “In Russia as well as England they are talking about Newcastle being interested in me and there has been no concrete offer. “In principle if they made an offer I would be interested”. That’s from Arshavin. We did have a chance to sign him before the Euros. Alladyce was himself talking to Arsenal about the possible signing of Diarra. Then he got sacked he went to Portsmouth. The Chronicle were reporting that he was in for Arshavin for about £7m too. Macas, but sacking him meant paying him up the rest of his contract. Then appointing new manager and probably a ‘signing on’ fee. I think with the appointment of every manager, Ashley’s spending has decreased with each one. Johno I believe from buying the club up until Keegan’s appointment he genuinely wanted to buy our way to being a great club. Not loads, £20mill a year like he stated, but that’s enough. The debts obviously were too much for him. He opted for a different method, which, at the time of Keegan being here, threw a spanner in the works so great it backfired awfully. Wrong place, wrong time. The burning question I want to know is though, if we get promoted and he puts £20 mill into transfers without too many important players being sold, how or will opinion change at all from fans? It’s all theoretical but interesting I suppose. I’ve said all along since we went downhill with Ashley that, despite everything, if in 5 years time we’re a debt free, maybe even self sustaining premiership club with a good wage bill then i’ll be happy. Surely people know that the Shepherd cash would have dried up with the debt and current economic climate? Ah i don’t know, it’s all a big ball of what ifs etc. If we get promoted this season do you think it’s unreasonable to expect all the Sky money to be put into the transfer pot? I keep hearing were in the best financial shape we have been in for years so is it the least we can expect? We will need at least that just to stay up. Dunno what will happen if we got up. If we do I think a good chunk of money would need to be spend on a goal scorer. If we go up, MA will just say he cant risk spending much money incase we get relegated again. don’t get me wrong we need to be self sustainable but the only way of doing that and becoming successful is by having a massive stadium and a wage budget under control, it’s a very slow process without huge finacial investment but it’s worth it in the long run, but if MA is going that way about his business he will need a decent chairman, but he wont try to improve us he will carry on trying to get blood out of a stone. I can see us becoming a yo-yo club unfortunatly. Jose is still a young player guys dnt forget that he will improve. Dnt sell him when he play badly somtimes. Tores plays badly sometime too. He is not Shola “young player” but to be fair shola have play well this year. He just bloom at a later age. Just like “andy raid”. I hve never agreed to the sacking of Big Sam Allardyce. He’s been on a wonder diet since then Toonsy (‘Beefy’ the superfan that is, not Mike Ashley). See the Ressies are getting beaten off Benfield. Hadn’t realised how many of the feckers in that Saints team I’ve played with or against. Belly scored as well, he’s a physio at the town still as well I think. He’ll be pretty smug tomorrow walking around the training ground. Hmmm ! Jose over six feet tall , perhaps that is the listed height, certainly does`nt look it , but give you the benefit of the doubt. Yeah believe MA had probably intended to invest perhaps the stated twenty mill a year, but having spent the first five years worth on top of what Big Sam spent, in year one (The hidden debt from our Geordie con men Freddy & the Halls, to the tune of 100m) that and the recession, obvious had it`s effect. So regardless of who owned the club there was never a chance of getting Arshevin or Diarra and I hate to think what would have happened to the club with those kind of debts had MA not bought it at the time. All the talk about Big Sam signing Arshavin makes me ask – didn’t Big Sam choose Alan Smith over Arshavin. I am sure I read it somewhere that he choose Alan Smith as a purchase over Arshavin because Smith was an experienced Premiership player. How exactly was Allardyce going to get Arshavin and Diarra then?